New events for spring 2019-- Bay Area, Columbus, Vancouver! April 17th: Andrew Aydin and I will do a talk & signing for March as a part of San Mateo’s all-county reading selection— Fox Theatre (2215 Broadway, Redwood City CA). April 27-28: I’ll be in Columbus, Ohio at SPACE (Northland Performing Arts Center, 4411 Tamarack Blvd). I’ll also be doing my first ever live reading from Come Again on the 27th at Kafe Kerouac, as a part of the SPACE After-Party— please come support all the brave introverts! May 18-19: I’ll be a special guest at VanCAF in Vancouver, BC (The Roundhouse, 181 Roundhouse Mews), signing at the Pulp Fiction booth and participating in panels as well. Info on signing/panel times TBC! Here’s a master list of all my upcoming events, with more reliable and up-to-date details. More info, and maybe an extra event or two, forthcoming— see you there! 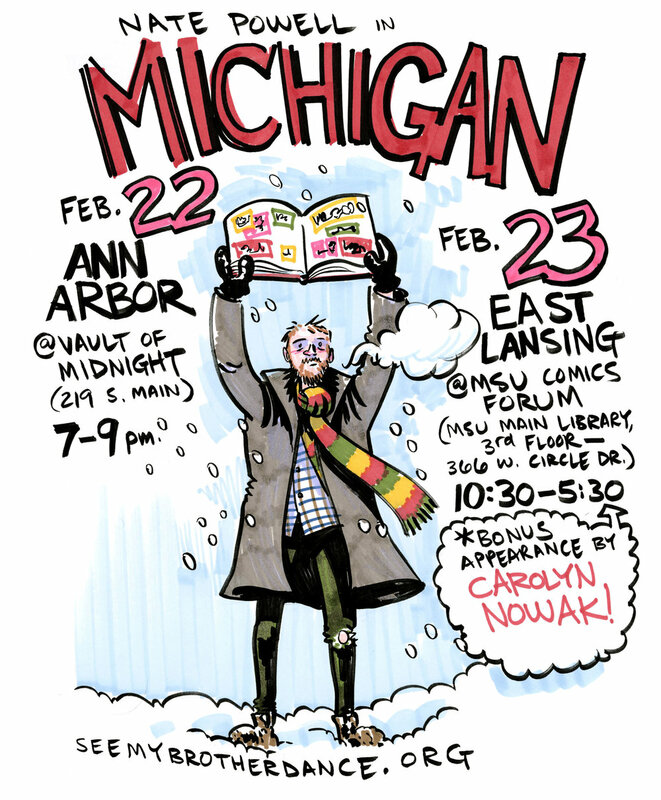 Friday, February 22nd in Ann Arbor, at Vault Of Midnight (219 S. Main St.), 7-9 pm. Here’s the FB event page. Saturday, February 23rd in East Lansing, at the MSU Comics Forum (MSU Main Library, 3rd Floor, 366 W. Circle Dr.), 10:30am-5:30pm. 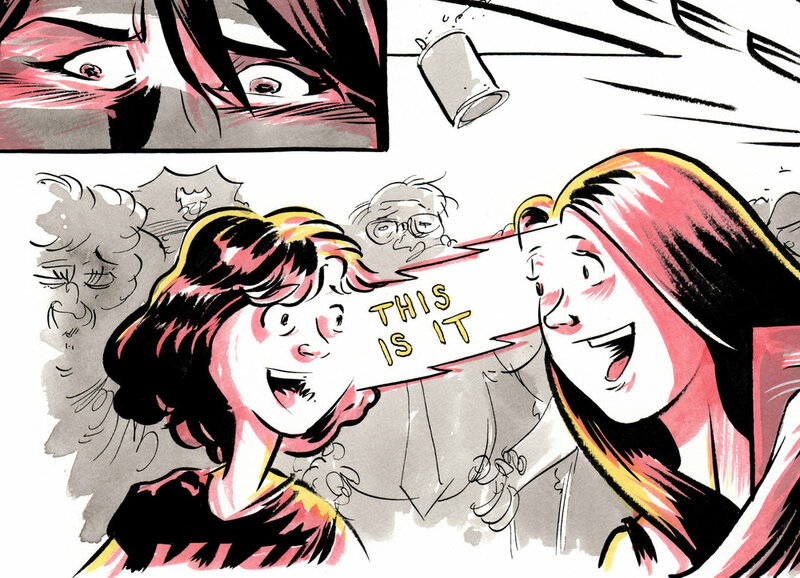 Brilliant cartoonist friend Carolyn Nowak will be hanging at my table too— her book Girl Town is one of the very best comics of 2018! Spread the word— thanks! See you there. COME AGAIN on NPR's Best Books of 2018 list! I’m thrilled to find Come Again on NPR’s Best Books of 2018 list, alongside great work by buds Cecil Castellucci, Marley Zarcone, Vera Brosgol, Lisa Hanawalt, Eleanor Davis, Ben Passmore, Jose Villarrubia, Ngozi Ukazu, Magdelene Visaggio, and more— go comics! Thanks for supporting the medium of comics, everyone! Miami Book Fair this weekend! See you this weekend at Miami Book Fair— my last comics event of the year! Saturday is “Beasts Of Our Own Making” w/ Dean Haspiel & Jonathan Ames! Sunday is “Pretty On The Outside: Village Secrets In Fiction” w/ David Small & Maggie Thrash! Signings are immediately after the panels— see you there! Columbus, Ohio— see you this weekend (September 29-30) for Cartoon Crossroads Columbus at the Metropolitan Library (96 S. Grant)! I’ll be at table 36, with copies of my new book Come Again, a few copies of the “rare-in-the-US” Spanish March omnibus, and most of my older work as well. Saturday at 3:15 I’ll be on the “Drawing Injustice: Activism & Artistry” panel in the Carnegie Room. 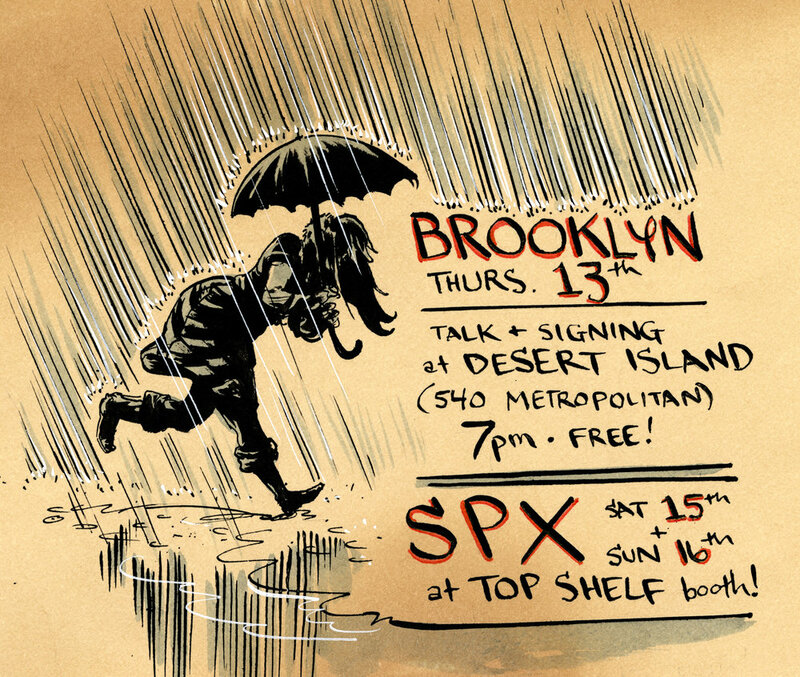 Brooklyn & SPX signings this weekend! Come join me for a few ill-timed East Coast events, in the middle of a giant hurricane! Thursday, Sept. 13th— I’ll be in Brooklyn, doing a talk/signing for my new book Come Again— 7pm at Desert Island (540 Metropolitan Ave.), as a part of Brooklyn Book Fest! Saturday-Sunday, Sept. 15-16th— I’ll be slangin books at the Top Shelf booth at the Small Press Expo in North Bethesda, MD! My official signing schedule is Saturday 11-2 and 4-6, then Sunday 12-1 and 2-5:30. I’ll also be on the “Look Back And Laugh: Youth And Autobiography” panel Sunday 1-2pm in the White Flint Auditorium. COME AGAIN signing in Indianapolis, Sept. 1st! If you're around Indianapolis, come to Hero House Comics (1112 Prospect St.) on Saturday, September 1st from 2-4pm, where I'll be having a signing for the debut of my new graphic novel Come Again. COME AGAIN talks/signings this week in California & Indiana! Wednesday, August 15th, I'll be doing two events at Comix Experience (305 Divisadero) in San Francisco! A public signing there from 6-7:30pm, followed by a discussion/Q&A/signing with the Comix Experience Graphic Novel Club at 8pm. Thursday, August 16th, I'll be doing a talk/Q&A/signing at Wow Cool in Cupertino, CA (21607B Stevens Creek Blvd.) from 7-9pm. Saturday, August 18th, I'm having a book-release signing for Come Again at my local comic shop Vintage Phoenix (114 E. 6th) in Bloomington IN from 2-4pm! Thanks, everyone, for all the support and engagement so far-- see you there! NPR review of COME AGAIN! Here's a new piece NPR just published about my new graphic novel, Come Again. Thanks for picking up the book, everybody-- and thanks to those who came out to see me in Arkansas and Chicago! The next few weeks will include talks and signings in San Francisco, Cupertino, Bloomington, and Indianapolis-- I'll post updates to those soon. COME AGAIN is out in bookstores everywhere today! At last, Come Again is available everywhere today-- comic shops, bookstores, and online! Please go visit your local bookstore, or there's always Amazon if you must. Chicago: I'll see you Thursday 8/9 at 7pm for a talk/Q&A/signing at Quimby's! Thanks, everyone, for supporting my work. Arkansas & Chicago signings/talks in early August! * Friday, August 3rd-- Fayetteville Public Library, Fayetteville AR. I'll be doing a slideshow talk about Come Again, March, and my general path through comics at 1pm, followed by a loose workshop for independently motivated/interested artists and storytellers. Nightbird Books will have books available for sale at the library. * Friday, August 3rd-- Nightbird Books (205 W. Dickson St.), Fayetteville AR-- I'll be doing a signing from 7-9pm. * Saturday, August 4th-- The Comic Book Store (9307 Treasure Hill Rd. ), Little Rock AR-- I'll be signing from 2-4pm. * Saturday, August 4th-- Zine Night, Vino's (923 W. 7th), Little Rock AR-- I'll be selling books and hanging out from 7-10pm. * Thursday, August 9th-- Quimby's, (1854 W. North Ave.) Chicago IL-- I'll be doing a slideshow talk, Q&A, and signing at 7pm. Aaaaaaaand here are recent reviews of Come Again in Publishers Weekly (starred review), The Comics Journal, and Arkansas Times. More info and dates soon-- stay tuned! I'll be at Top Shelf/IDW's booth (#2743) all weekend at Comic-Con International in San Diego, CA for the debut of my new graphic novel, Come Again. * Thursday, 7/19: signing at Top Shelf booth #2743, 1-2:30pm and 4-6pm. 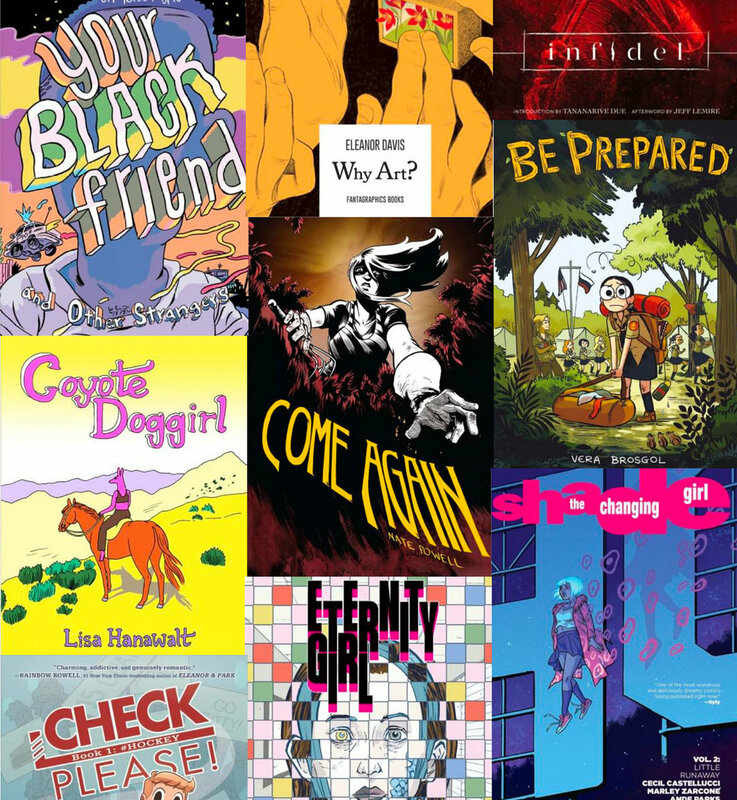 * Friday, 7/20: "The Human Condition: Connecting Humanity With Graphic Novels" panel w/ TBA. 1-2pm, Room 23ABC. * Friday, 7/20: signing at IDW booth #2743, 5-6pm. * Saturday, 7/21: signing at IDW booth #2743, 1-2pm. * Saturday, 7/21: signing w/ Andrew Aydin at CBLDF booth #1918, 2-3pm. * Saturday, 7/21: I'll be the keynote speaker at the CBLDF's live art auction-- with an original MARCH piece up for sale too! Hilton Bayfront, Sapphire AB, 8pm. * Sunday, 7/22: signing at IDW booth #2743, 1-2pm. Head over to your local comic book shop today-- Come Again is here from Top Shelf/IDW! I'll be at San Diego Comic Con next week for its big debut, and it'll be available in bookstores/online August 7th. Check out my events page for tons of travels, signings, talks, and conventions for the rest of the year. Direct mailorders are ongoing-- my copies of the books didn't arrive until last Friday, so I'm getting them shipped off as quickly as possible. Thanks for your patience! Here's an interview I just did with Sean Clancy at my hometown newspaper, the Arkansas Democrat-Gazette-- discussing Come Again, punk, March, Run, Two Dead, and the area ghost legends which shaped our lives there. Come Again will be out in comic book stores this Wednesday, July 11th! It'll be available in bookstores and online August 7th. Here's a brief interview I did at Publishers Weekly about the concept and creation of my forthcoming book, Come Again. If you'll be at the ALA conference in New Orleans this weekend, check out advance copies of the book at the Top Shelf/IDW booth! It'll be released in comic book shops on July 11th, and bookstores/online August 7th. You can pre-order the book from Amazon here, or directly from me here. Sneak peeks of COME AGAIN: steamy, dreamy, secret horrors. My new graphic novel Come Again will be out in comic shops on July 4th, and in bookstores/online on July 31st-- until then, I'll be teasing out some images into its luminous moments and darker corners alike. Please follow me on Instagram and Twitter for more-- thanks so much! Starred review for COME AGAIN in Publishers Weekly! "Rendered in fluid, magical brushwork tinted in the colors of a sunrise and filled with mysterious shadows and crannies... this enchanting solo effort reveals even greater depths to Powell’s gift for visual storytelling and creating appealing, human characters." Out from Top Shelf in July! You can pre-order from Amazon here, or better, pre-order with your local comics shop to get it a few weeks early with a signed bookplate! COME AGAIN direct market bookplates are here! The limited-edition, direct market Come Again bookplates are here! I'm doing a limited run of signed bookplates for Come Again, available exclusively through comics shops who order 6 or more copies-- readers, please pre-order copies through your shop! The FOC (final order cutoff) date for this book is June 11th (Diamond: MAR180563; ISBN 978-1-60309-428-3)-- please order by then, and I'll be personally shipping out the bookplates to retailers. Please spread the word, and thank you for supporting your local comic shop! Come Again should be in shops from Top Shelf/IDW on June 27th, and in bookstores July 31st (my 40th birthday!). Limited signed COME AGAIN bookplates for direct market pre-orders! The FOC (final order cutoff) date for this book is June 4th (Diamond: MAR180563; ISBN 978-1-60309-428-3)-- please order by then, and I'll be directly shipping out the bookplates to retailers. Please spread the word, and thank you for supporting your local comic shop! Come Again should be in shops on June 27th, and in bookstores July 24th.